This is a 210V Cat Just Out Of The Mold. 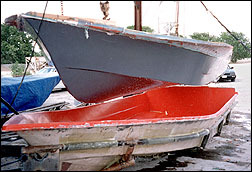 Tran Sport boats are 100% hand-built. Above is a photo of the plug (top) being removed from the newly formed mold. The mold will be used to form the hull of the boat. Above: After setting the top section on the 22-T on the left and the 210V Cat on the right, the semi completed boats are moved to the assembly room where the accessories are put in place. The finished product - This Tran Sport boat was built for the Texas Parks and Wildlife Dept. Here, a Parks and Wildlife officer was on-hand for the floating of their new boat.